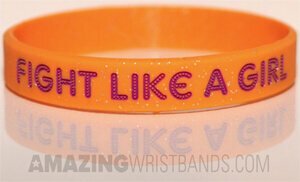 Glittering wristbands are a popular sparkling option for any wristband types. The shiny, glittering effect makes your bracelets more fashionable and helps them stand out. Add a fun glitter effect! Swirl or segment the colors on your wristband. These are easy to create at www.AmazingWristbands.com! You can choose from various types, including ink-filled, screen printed, embossed, debossed and more. We carry different widths, and you can also choose your own font style, custom colors, and clip art. We offers 100% silicone products, affordable prices, and customer service that are second to none. Visit us online today for a quote! *Our default color for glitter is Silver, which tends to produce the best results. Gold glitter is available upon request.